It’s a humorous but stark nod to a reality that Catholic Americans are facing today: a slow, but sure dissolution of freedom of religion, this time through forcing artificial contraception upon Catholic institutions. In his 1968 encyclical “Humanae Vitae,” Pope Paul VI waxed prophetic of the consequences of artificial contraception — the same contraception that the current federal administration wants to force Catholic institutions to provide in health care plans. This mandate includes drugs that produce abortions, as well as sterilization procedures. Most Catholics have a pretty clear understanding that the Church teaches artificial contraception is an intrinsic evil — yes, a sin. But many — as evidenced through numerous studies that show a majority of Catholics still use contraception — either don’t fully understand or appreciate the Church’s teaching. “This particular doctrine, often expounded by the magisterium of the Church, is based on the inseparable connection, established by God, which man on his own initiative may not break, between the unitive significance and the procreative significance which are both inherent to the marriage act. While the Church repeatedly has noted that the birth control pill has the ability to act as an abortifacient, members of the medical community also have spoken to that reality. As an abortifacient, the pill has the ability to prevent a human embryo from implanting in a uterus. Yes, that means it’s an abortion. In the secular world, it’s been touted time and time again that contraception will lower unintended pregnancies, reduce abortions and even benefit marriages. A 2011 Guttmacher Institute fact sheet states that nearly half of all pregnancies among American women are unintended. Four in 10 of those are terminated through abortion. And 54 percent of women who have had abortions had used contraception during the month they became pregnant. 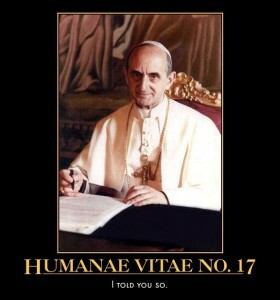 Paul VI sure told us so, didn’t he? This article courtesy of the St. Louis Review. Jennifer Brinker is a staff writer for the St. Louis Review, the newspaper of the Archdiocese of St. Louis. She covers the St. Louis pro-life beat, among others, and is a proud wife and mother of two children. She can be contacted at jbrinker@stlouisreview.com or on Twitter @JenniferBrinker.